Tomorrow I’m taking part in my local club’s official Big Day event – the Hudson-Mohawk Bird Club’s 73rd Annual Guy Bartlett Century Run – for my fifth year in a row. My teammate Tom and I have managed to surpass the contest’s namesake goal of 100 species in a day on each of these runs, and we even had the highest species count last year with 124 birds found in Albany County, New York – though that’s still a few short of the 128 Corey counted way back in 2008. Personally, I’m expecting nothing less than a Kirtland’s Warbler to get me to 129 species tomorrow, but scouting efforts to date paint a more grim picture. I’m planning to be up well before sunrise tomorrow, so no drinking tonight. But after an entire day of Century Run birding, I always look forward to a celebratory beverage. Tom and I traditionally end the day sipping whisky or bourbon in his backyard, waiting for a Ruby-throated Hummingbird to show up at his feeders, or desperately keeping an eye out for a last-minute save on Downy Woodpecker, Carolina Wren, White-breasted Nuthatch, or some other ridiculously commonplace bird we inexplicably managed not to see or hear all day. There’s always one. But I like to save my chaser for when I get home, preferring a beer hoppy enough to wake me up a bit as I scarf down my late takeout dinner and regale my non-birding partner with tales of the day’s triumphs and shortfalls, but strong enough to knock me out until Sunday morning when it’s all over. Moments like this call for a big can of double IPA. And of course, I had to find one with a bird on it so I could review it here at Booze and Birds. 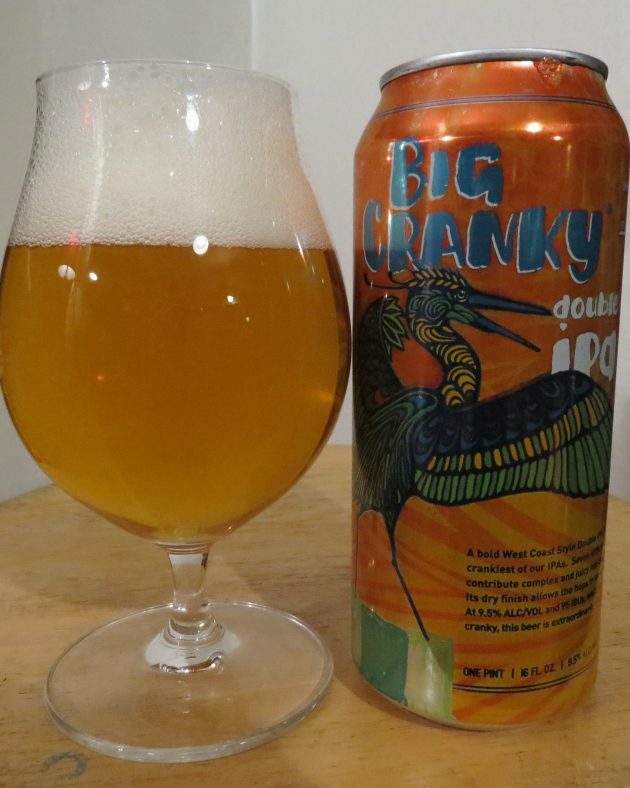 Big Cranky is a double IPA by the Stony Creek Brewery of Branford, Connecticut. 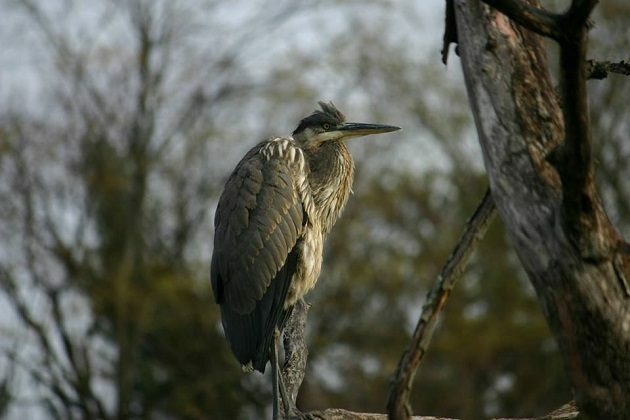 The brewery’s mascot is a Great Blue Heron named “The Big Cranky” who graces all of Stony Creek’s beers with its cantankerous presence. 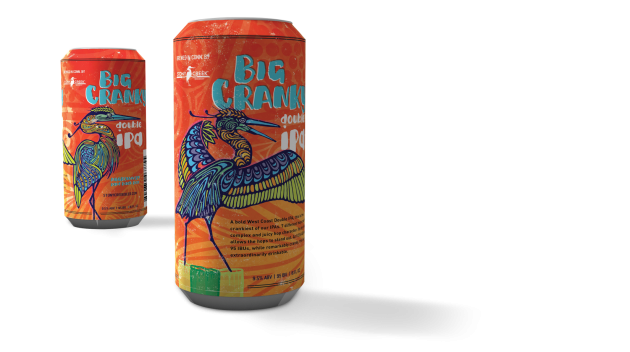 Big Cranky has two smaller siblings in Stony Creek’s IPA series: a session IPA named Little Cranky and a standard-strength IPA just called Cranky. I would’ve gone with Least Bittern and American Bittern for some ardeid variety, but I do have to give Stony Creek credit for naming their imperial stout No Egrets. I know a lot of people aren’t fans of IPAs so I can only imagine what they must think of double IPAs. But if you do like IPAs, bigger, stronger, and hoppier double IPAs are just more of a good thing. Big Cranky weighs in at an imposing 9.5% alcohol by volume and is a brewed with seven different varieties of hops, so even devoted hopheads should approach this big, boozy beer with care. But if you’re parched, exhausted, and flushed with Big Day birding success, by all means, throw caution to the wind and drink up with abandon. You’ll be sleeping soundly shortly in any case. Yup – looking pretty cranky. Despite the name, Big Cranky certainly looks cheerful enough, giving off a burnished amber glow under a blooming white head of lacey foam. An intense, fruity hop bouquet offers aromas of apricot, passionfruit, pineapple, grapefruit, and orange blossom. There’s also a slight hint of onion in the nose, a note I’ve been picking up in other very hoppy beers of late, a character attributed to the use of certain hop varieties. In Big Cranky, it’s not at all harsh – more of mild – almost floral – scallion aroma that adds a satisfying savory element to the beer under all that sweetly pungent fruit. Stony Creek is coy about the varieties of hops that go into Big Cranky, but the Summit, Mosaic, and a few other strains are known for producing this effect. The palate is just as hoppy as the bouquet, bitter and fruity with grapefruit and mango, but backed by a sweet graham cracker maltiness. Not surprisingly for such a boozy beer, Big Cranky drinks a bit “hot”, though I found its warmth well-matched by other flavors, particularly its dry, citrusy finish. I’m not sure this is how the birding universe works, but I get the sneaking suspicion that in writing this review, I’ve just jinxed myself out of seeing a big, cranky Great Blue Heron on my Big Day tomorrow. It’ll be nice to have both under my belt – one literally and the other figuratively – at the end of the day, but if my superstitious apprehension is borne out, at least I’ll have a can or two of big, hoppy double IPA with which to console myself. Okay, okay, wood warblers are the bomb.